Two of the most experienced, effective and respected community leaders working with the homeless population, Chuck Gerard of the White Bird Clinic and the Rev. Dan Bryant of First Christian Church in Eugene provide interesting observations about the surprising impact of the Eugene Occupy Camp and how its unprecedented work with the homeless is helping them in their work and the entire Eugene community. Check out video link here. Next Entry: 12.16 Winter Feast Friday!! 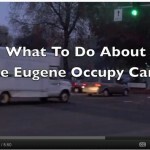 © 2019 Occupy Eugene. Please feel free to distribute any of the original content on this site across the internet. Powered by Prototype ( Log in ).